Speaking at Saban Center for Middle Eastern Studies, Obama presents diplomatic agreement as stopgap solution for nuclear program. President Barack Obama spoke at the Saban Center for Middle Eastern Policy in Washington Saturday, advocating diplomatic options with Iran. "It is in America's national security interests - not just Israel's or the region's - to prevent Iran from getting a nuclear weapon," the President declared. 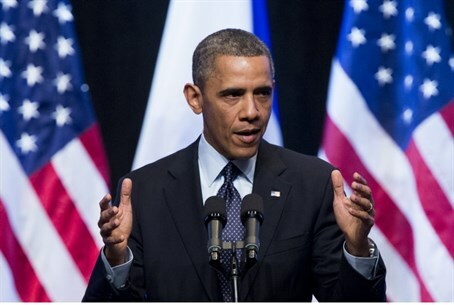 "Iran cannot and will not advance its nuclear program or increase its nuclear stockpiles," Obama said. The President provided context for the decision. "When I first got into office, Iran went from just having 200 centrifuges to thousands of centrifuges - some of them advanced," the President stated. "Their breakout capacity had accelerated in ways that we had been concerned about for some time." Until now, he maintained, "we have established an unprecedented sanctions regime that paralyzed the Iranian economy and reduced oil exports in half. Their economy shrank because of these sanctions," Obama stated. "It is precisely because of the economic sanctions - which led the Iranian people to take a different position […] this led to the election of [Iranian President [Hassan] Rouhani." Obama stressed that the deal is not based on trust - noting that Rouhani has made statements against the Israel and the US - but on the options available. “What I try to describe is not a choice between this deal and the ideal, but this deal and other alternatives,” he stated. "The best way to prevent that is through a comprehensive, verifiable, diplomatic resolution." "It is important for us to test that proposition over the next six months," he stated, and emphasized "at the end of the next 6 months, if Iran shows that it cannot keep [its end of] the deal, we are not worse off." Despite this, Obama admits that there are considerable risks involved in the program, noting the US's failure to prevent a North Korean nuclear weapon and admitting that "We have to take seriously the possibility that it could produce a nuclear weapon." However, he insisted that the current diplomatic track had borne fruit. "We have been able to craft an international effort and verification mechanism around the Iran nuclear program that is unprecedented and unique, but isn't easy - that's why we have to take it seriously." "If I could create an option where Iran would destroy every nut and bolt of their nuclear program, and foreswore producing nuclear weapons [. . .] I would. But that option is not available," he said. "Prime Minister Netanyahu and I have had constant consultations on these issues throughout last 5 years," the President continued, dismissing talk of a strain in relations between Jerusalem and Washington. “There are times where I, as president of the United States, am going to have a different tactical perspective and that is understandable,” he said. Nonetheless, he assured the audience that "the US military cooperations with Israel have never been stronger. Our intelligence cooperation has never been stronger. Our support of Israel's security has never been stronger." "Our commitment to Israel's security is sacrosanct," he concluded.